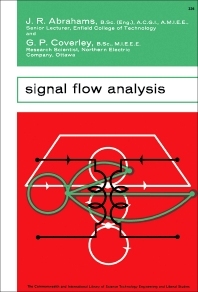 Signal Flow Analysis provides information pertinent to the fundamental aspects of signal flow analysis. This book discusses the basic theory of signal flow graphs and shows their relation to the usual algebraic equations. Organized into seven chapters, this book begins with an overview of properties of a flow graph. This text then demonstrates how flow graphs can be applied to a wide range of electrical circuits that do not involve amplification. Other chapters deal with the parameters as well as circuit applications of transistors. This book discusses as well the variety of circuits using thermionic valves or vacuum tubes. The final chapter deals with the application of the flow graph to find the equation of motion of an electrical meter movement where the feedback is mechanical. This book is intended to be suitable for the undergraduate engineering students, in a middle of a degree or diploma course, or for the practicing engineer who wishes to obtain a speedy solution to an electrical problem.